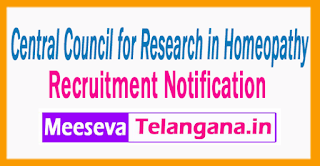 Central Council for Research in Homeopathy (CCRH ) Has Invited Application Form For 15 Professor, Reader, Lecturer. 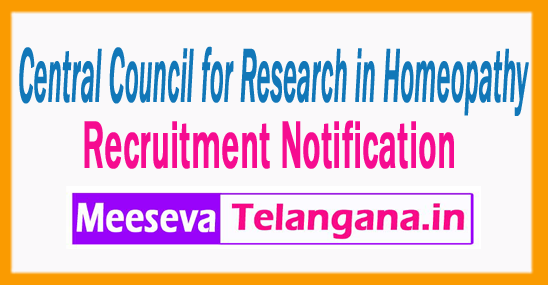 All EligibleCandidates To check Eligibility details for CCRH Job Advertisement and Apply Offline Before 30-06-2017 All Candidates Applying For CCRH Recruitment 2017 - 15 Professor, Reader, Lecturer, Should Check Vacancy Details- Educational Details & Experiences Requirement, Exam Pattern, Syllabus, Age Limit, Selection Criteria, Admit Card, Results, Exam Date, Before Applying. INR Rs. 90,000/- (Post 1,2), Rs. 70,000/- (Post 3,4), Rs. 50,000/- (Post 5,6), Rs. 38,000/- (Post 7), Rs. 20,000/- (Post 8). All Candidates should have completed Graduation Degree / Post Graduation Degree or its equivalent qualification from A recognized Board/University. All Eligible job seekers Can Download application Form through official website (http://www.ccrhindia.nic.)in. After Filling The application form, candidate must send by hard copies of application along with relevant testimonials to the following Address before30-06-2017. Last Date for Receiving of Offline Application Form Is: 30-06-2017 .